I am a loooooong time fan of Sherman Alexie - his Lone Ranger and Tonto Fistfight in Heaven is a favorite of mine. Any new Sherman Alexie book is worth a celebration, one billed specifically as ya only makes the party bigger. Loosely based on Alexie's own life, this fictional account of a piece of Junior's life growing up on the Spokane Indian Reservation is funny, sad, intelligent, and most of all telling. Telling of being a teen, of being a teen with dreams (cartoons included, yay! ), of being a teen with dreams in a place that isn't so great for the fulfillment of dreams. American Indian issues are not always at the forefront of our minds - there's so much other god-awful stuff going on and its hard to keep all of it going all the time if you want to live a generally optimistic life - but this book put the questions back in mine while in no way being didactic or depressing. And I felt, afterward, I had a much better emotional sense of what is going down on reservations. I read All In by Pete Hautman not realizing that it is actually a sequel to the book No Limit. I haven't read No Limit, and it didn't matter - I mean, it wasn't central to the story that I read No Limit first as everything that happened there is summarized here and it is easy enough to follow along. 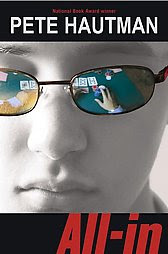 All In is the story of Denn Doyle, age 17, who is a poker mastermind and apparently in No Limit discovered his talent and made a lot, I mean a lot, of money and left home for Vegas (with a fake id so he could gamble there). So in All In Denn is gambling in Vegas with big time poker players. Sometimes I catch the big poker tournaments on tv and I don't really know what's happening, but this book actually helped me understand poker better and how those tournaments are run. Of course, it isn't a smooth road for Denn - he falls for a girl, the wrong girl of course, and gets mixed up with some people who aren't rooting for him to win. I liked this book because it was a quick, fun read, and the story wasn't as predictable as you might imagine. I also like that the narrative changes viewpoints so you get to understand what many of the major characters are thinking as it goes through. And finally, I liked that Denn is not really your typical main character - he isn't as good or as bad as you normally get in a book. In fact, he's rather average. I like that for a change. This is the second book by The Kite Runner author, Khaled Hosseini. Where the first book followed a male story line, this one follows the lives of two Afghani women, Marian and Leila, whose lives are initially drastically different until they are brought together in a life that most Americans find hard to understand because it is just so unfamiliar, so different, from our recent history. While I thought the Kite Runner was a more potent book, a more powerful and moving story, I still loved this book and perhaps learned more about Afghani history from this one. Hosseini frequently included dates in the chapter headings and in the text, and throughout the arc of the book included both personal and national history. In fact, I loved the literary aspect of how the lives of the women related fairly directly to what was going on politically in the country. This is the looooooooooong anticipated sequel to Empress of the World, also by Sara Ryan. But in reality, this is a solid book in its own right and I think it is probably more enjoyable to just think of it like that, instead of as a sequel. Here we follow Battle to Seattle, where she is about to start college, away from her parents and to her black sheep of a brother, to live in a crazy house with some fun and crazy people (reminded me a wee bit of Broken for You, but just a wee bit). A quick read, a sweet read, and an emotional one for anyone who has had a sibling who is maybe not so . . . ermmm . . . well, normal. I mean, Battle isn't the most "normal" person herself, either, but she's got it together in comparison to her older brother. And it's hard when your older sibling needs as much help as Battle's brother needs. Very hard.